BEVERLY HILLS, Calif. - Aaron Kirman Partners is pleased to announce a listing in an exclusive neighborhood in the Hollywood Hills within West Hollywood. Providing the ultimate experience for qualified home buyers, Aaron Kirman Partners offers clients the chance to explore property first hand. Celebrity developer and designer Max Cherniavskyi, and San Francisco Bay Area real estate financier, Lodgepole Investments, LLC, have just announced their latest project at 8741 St. Ives Drive. Located at the end of a cul de sac in the West Hollywood Hills with breathtaking views and a design aesthetic to match, 8741 St. Ives Drive is truly an incomparable estate. Max has been credited with some of the most groundbreaking new construction in Los Angeles, and his talents are sought out by celebrities and business tycoons who value his unique take on modern design that blends styles and materials to create lavish, one-of-a-kind homes. Located at 8741 St Ives Drive is a truly one of a kind estate. This is an amazing opportunity to create one of the most notable jewels of West Hollywood. Nestled in a gated community at the end of a cul-de-sac with lush trees and natural scenery, this lot of over 28,000 square feet has great potential to become the home you’ve always dreamed of. 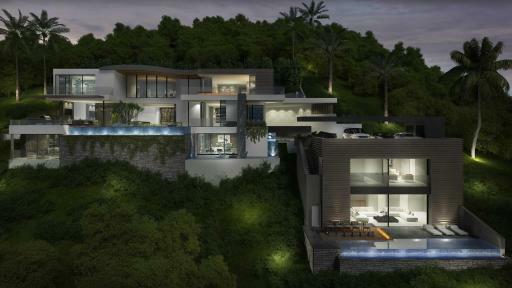 With a spectacular floor plan of 16,686 square feet, a multi-level house can be created in the Hollywood Hills with an infinity pool near the side of the bluff, overlooking the city lights of Los Angeles. A nearly 2,000 square foot guest house is an especially exceptional addition to this development. These modern renderings balance patio space with the interior of the home, giving any owner the chance to entertain guests in private parties and enjoy the stunning view and outdoor pool. Located near the Sunset Strip makes it possible to explore the city, and it’s just minutes to restaurants, movie theaters, shopping, and world famous landmarks such as Chateau Marmont, the Sierra Towers, and Melrose Avenue. The Estate is under exclusive representation by Aaron Kirman for $13,995,000.